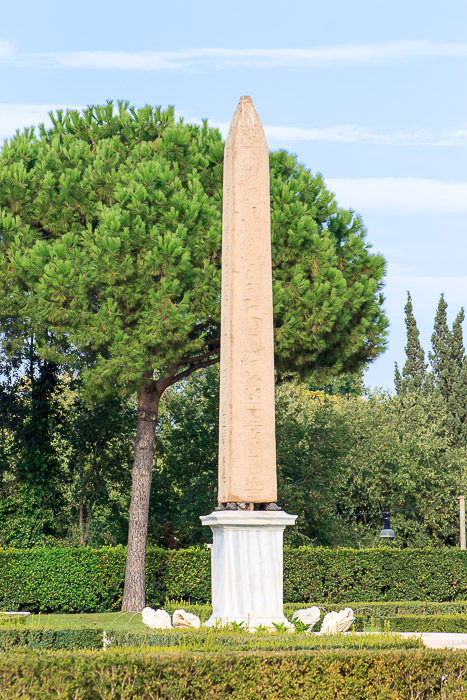 The Villa Medici Obelisk is 19th century copy of the original, found in the gardens and taken to Florence. It is visible only, as far as I know, when taking a free guided tour of the gardens of Villa Medici. Just go up to the welcome desk inside Villa Medici and ask for a tour of the gardens. You'll need to state which language you want the tour to be in. English tours are at noon. But if you just want to see the obelisk, you can take a tour in any language, see the obelisk and the courtyard, then leave the tour and exit the villa. Tours are about every hour and are free. While you're waiting for your tour, you can probably go see the Pincian Obelisk, about a 10 minute walk from here. See all Villa Medici Obelisk photos.